sewing. modern vs. historical. 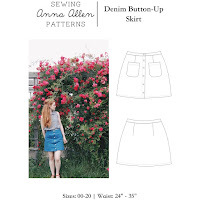 | Anna Allen Clothing Blog: sewing. modern vs. historical. So lately I've been feeling not so enthusiastic about historical clothing. I get into different moods. Sometimes the only things I want to make are historical clothing, mostly from the mid 19th century. 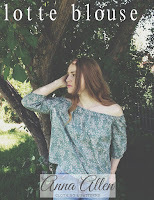 While there are other times I'm itching to make myself some vintage inspired pieces to wear. I have a business sewing historical clothing and it's something I am truly passionate about, so I'm not complaining. But right now I have so many projects to get done and somehow I'm unable to get inspired about them. I'm even working on a different and more exciting project than the majority of gowns I tend to get commissioned to sew all the time. This one is made of silk taffeta and will have tucks on the skirt, modified pagoda sleeves, lots of ruching, buttons up the front and a small white collar and undersleeves to match. It should be really pretty once I'm finished with it. But at the moment I really really want to make myself a pair of cropped pants. I thought about making them with a higher waist. Either something like sailor pants with buttons on either side or just make it with large buttons going up the front opening. I started out with a 1940s slacks pattern, but I forgot that slacks in those days were made differently than today and it ends up looking more like culottes rather than pants. Not something I'm really too eager to get into right now. But I do need some type of summer pants to wear. I hate short shorts. I'd wear them if I could, but my legs are too pasty white to really pull off that look. Not to mention I haven't worn short shorts since I was 17. I've got a pair of those bermuda type shorts and they are okay, but I'm not sure I love them yet. I saw a picture on flickr of a girl wearing a pair of shorts that were about mid knee or sightly lower with cuffs. I really love that idea. I have the Built-by-Wendy pattern and I think I'm going to see how that works out. I've heard a lot of great things about her patterns, although oddly enough I'm not too excited about most of her designs right now. The baggy pregnant look is just not for me and most of her patterns seem to have this feature. At least the blouses and dress patterns do. I mostly like my clothing to be fitted. I tried to make a tunic once and I just looked like I was wearing a bag. I have a feeling these patterns are geared towards the inexperienced sewer, thus the easy pregnant styled clothing. Not to mention they're actually becoming popular?? There are too many people who can't pull off that look, but somehow they still wear this style. It boggles my mind, but whatever. I do appreciate these patterns coming out, though, because I wish more people would get into sewing and if these patterns help sewing become more popular, than I'm all for it! But I hate making clothes for myself that I will never wear. It depresses me when I make an outfit that I'm all excited about only to find it makes me look homey or pregnant. So we'll see how these cut-off pants turn out. I may try to be adventurous after all and cut the waist quite a bit higher on these. They could turn out super cute, but they might also backfire and make me look like I'm trying too hard. Hm... I suppose it depends on my mood when I find the time to actually cut them out.